NASA's Mars Exploration Rover Opportunity used its navigation camera to record this view of Santa Maria crater at the end of a drive during the 2,450th Martian day, or sol, of the rover's work on Mars (Dec. 15, 2010). The drive brought Opportunity to the western edge of this crater, and this view is eastward across the crater. 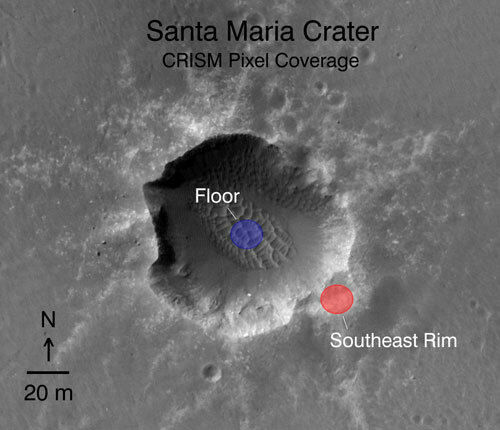 Santa Maria crater is about 90 meters (295 feet) in diameter. The rover team plans to spend a few weeks investigating this crater before resuming Opportunity's long-term trek toward Endurance Crater. Drives subsequent to Sol 2436 in early December 2010 brought Opportunity closer to Santa Maria Crater, which is about 90 meters (295 feet) in diameter. 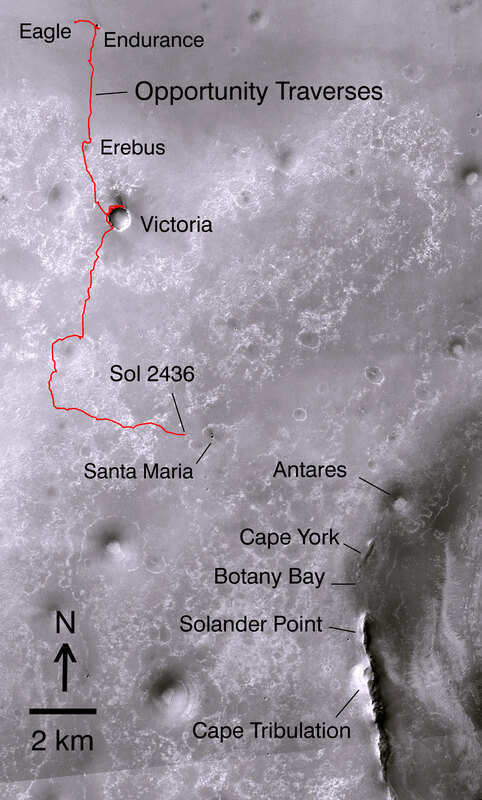 The rover team plans to investigate Santa Maria for a few weeks before resuming Opportunity's long-term trek toward the rim of Endeavour Crater. The western edge of 22-kilometer-wide (14-mile-wide) Endeavour is in the lower right corner of this map. 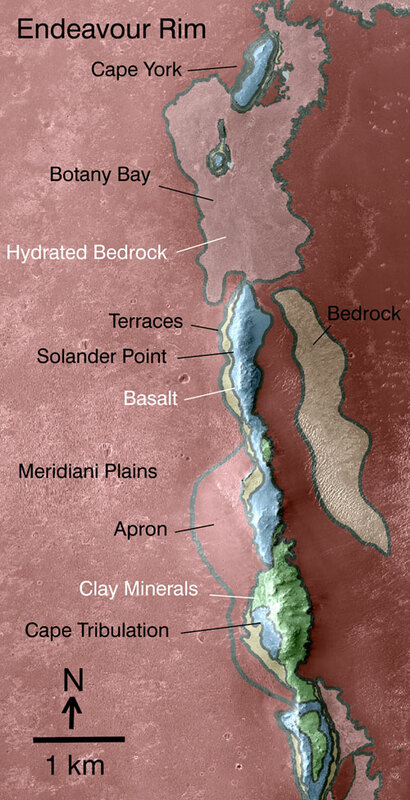 Some sections of the discontinuos raised rim and nearby features are indicated with informal names on the map: rim segments "Cape York" and "Solander Point"; a low area between them called "Botany Bay"; "Antares" crater, which formed on sedimentary rocks where the rim was eroded down; and rim fragment "Cape Tribulation," where orbital observations have detected clay minerals. The base map is a mosaic of images from the Context Camera on NASA's Mars Reconnaissance Orbiter. Image Credit: NASA/JPL-Caltech/MSSS/Ohio State Univ. NASA's Mars Exploration Rover Opportunity used its panoramic camera to record this eastward view of the horizon on the 2,424th Martian day, or sol, of the rover's work on Mars (Nov. 18, 2010). Portions of the rim of Endeavour Crater, several kilometers or miles in the distance, are visible at the left, middle and far-right of the image, rising above the Meridiani plain. Endeavour Crater is about 22 kilometers (14 miles) in diameter. The portion of the rim visible on the left in this image is at the northern edge of Endeavour. The portion in the middle of the image is on the crater's eastern edge of the crater. The portion at the far right is on the Endeavour's western rim, closer to Opportunity. An orbital view at http://photojournal.jpl.nasa.gov/catalog/PIA11837 offers context. The rover team chose Endeavour Crater as a long-term destination for Opportunity in mid-2008, after the rover had investigated the much-smaller Victoria Crater for two years. More than a year later, the goal became even more alluring when observations with the Compact Reconnaissance Imaging Spectrometer for Mars, on NASA's Mars Reconnaissance Orbiter, found clay minerals exposed on Endeavour's western rim. James Wray of Cornell University, and co-authors, reported observations of those minerals in Geophysical Research Letters in 2009. Clay minerals, which form under wet and relatively neutral pH conditions, have been found extensively on Mars from orbit but have not been examined on the surface. Additional observations with that spectrometer are helping the rover team choose which part of Endeavour's rim to visit first with Opportunity. This view is presented in approximately true color by combining exposures taken through three of the panoramic camera's filters, admitting wavelengths of 752 nanometers, 535 nanometers and 432 nanometers. Opportunity completed its three-month prime mission in April 2004 and has continued working in mission extensions since then. This view combines exposures taken through three filters of the panoramic camera (Pancam) admitting wavelengths of 752 nanometers, 535 nanometers and 432 nanometers. A portion of Endeavour Crater's eastern rim, nearly 30 kilometers (19 miles) in the distance, is visible over the Meridiani plain. Endeavour is about 22 kilometers (14 miles) in diameter. The rover team chose Endeavour Crater as a long-term destination for Opportunity in mid-2008, after the rover had investigated the much-smaller Victoria Crater for two years. The rover is headed for a portion of Endeavour's western rim not visible in this image. This view is presented in approximately true color by combining exposures taken through three filters of the panoramic camera (Pancam) admitting wavelengths of 752 nanometers, 535 nanometers and 432 nanometers. NASA's Mars Exploration Rover Opportunity used its panoramic camera to record this eastward horizon view on the 2,407th Martian day, or sol, of the rover's work on Mars (Oct. 31, 2010). The view is presented in false color to make differences in surface materials more visible. 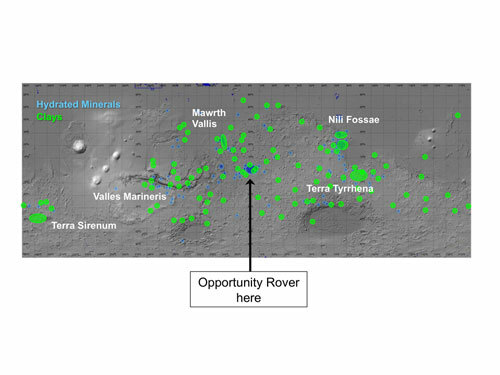 On this map of Mars, areas indicated in green are where spectrometers on spacecraft orbiting Mars have detected clay minerals and areas indicated in blue are where those spectrometers have detected hydrated minerals (clays, sulfates and others). Both clay and sulfate minerals are important for understanding past environmental conditions on Mars. Detections mapped here were made by the OMEGA visible and infrared mineralogical mapping spectrometer (Observatoire pour la Minèralogie, l'Eau, les Glaces et l'Activitè) on the European Space Agency's Mars Express orbiter and by the Compact Reconnaissance Imaging Spectrometer for Mars (CRISM) on NASA's Mars Reconnaissance Orbiter, reported by Bethany Ehlmann and Franáois Poulet of the Institut d'Astrophysique Spatiale, Orsay, France, and Janice Bishop of the SETI Institute and NASA Ames Research Center, Mountain View, Calif.
Observations by these spectrometers identified the hydrated minerals, including clays, after NASA's Mars Exploration Rover Opportunity had landed in January 2004, but the rover is still active, and is now close to exposures seen from orbit of each of these types of minerals. The base map is shaded topography based on data from the Mars Orbiter Laser Altimeter on NASA's Mars Global Surveyor orbiter. The blue-coded unit encompassing most of the southern half of the mapped region is ancient cratered terrain. In the northern region, it is overlain by younger sediments of the Meridiani Plains, punctuated by the even younger Bopulu impact. At Endeavour Crater, in the upper right near the gold line of Opportunity's traverse, ancient cratered terrain is exposed around the crater rim. Locations where orbital observations have detected clay minerals are indicated at the western edge of Endeavour and at two locations in the southern portion of the map. The scale bar is 20 kilometers (12.4 miles). The mineral mapping was done by Sandra Wiseman and Ray Arvidson of Washington Universty in St. Louis based on observations by the Compact Reconnaissance Imaging Spectrometer for Mars (CRISM) on NASA's Mars Reconnaissance Orbiter. 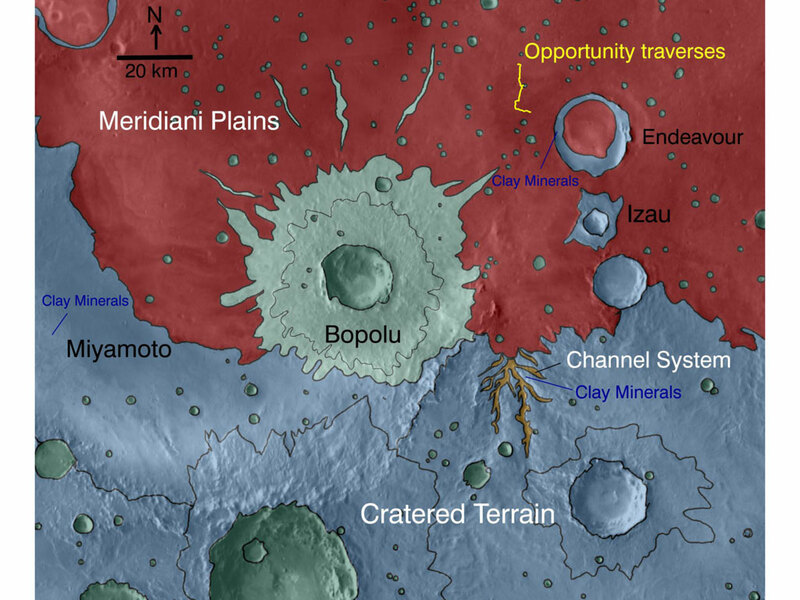 This map indicates some of the geological information gained from orbital observations of Endeavour Crater, which has been the long-term destination for NASA's Mars Exploration Rover Opportunity since mid-2008. Endeavour Crater is about 22 kilometers (14 miles) in diameter. As indicated by the scale bar of one kilometer (0.6 mile), this map covers only a small portion of the crater's western rim. A discontinuous ridge runs north-south, exposing basalt (coded blue) and clay minerals (coded green) believed to be from a time in Martian history before the deposition of sulfates on the portions of the Meridiani Plains region that Opportunity has seen during the rover's first seven years on Mars. The rover team plans to begin Opportunity's exploration of the Endeavour rim near "Cape York," which is about 6.5 kilometers (4 miles) from the rover's location in mid-December 2010. Cape York is nearly surrounded by exposures of hydrated bedrock. From there, the planned exploration route goes south along the rim fragment "Solander Point," to "Cape Tribulation," where clay minerals have been detected. This geological map is based on observations by the Compact Reconnaissance Imaging Spectrometer for Mars (CRISM) on NASA's Mars Reconnaissance Orbiter. NASA's Mars Exploration Rover Opportunity used its panoramic camera in a super-resolution technique to record this eastward view of the horizon on the 2,298th Martian day, or sol, of the rover's work on Mars (July 11, 2010). Rising highest above the horizon in the right half of the image is a portion of the western rim of Endeavour Crater including a ridge informally named "Cape Tribulation" (see Fig. 1). Super-resolution is an imaging technique combining information from multiple pictures of the same target in order to generate an image with a higher resolution than any of the individual images. Endeavour Crater is about 22 kilometers (14 miles) in diameter. The rover team chose Endeavour as a long-term destination for Opportunity in mid-2008, after the rover had investigated the much-smaller Victoria Crater for two years. More than a year later, observations by the Compact Reconnaissance Imaging Spectrometer on NASA's Mars Reconnaissance Orbiter revealed clay minerals on Endeavour's western rim, making the destination even more enticing for Opportunity's investigation. Cape Tribulation is one location where the clay minerals are exposed.